You Can Play the Spoons – Just Like On “Dog With A Blog”! Although we don’t watch a lot of t.v., our family has a soft spot in our hearts for any program with adorable animals, especially cute talking animals. 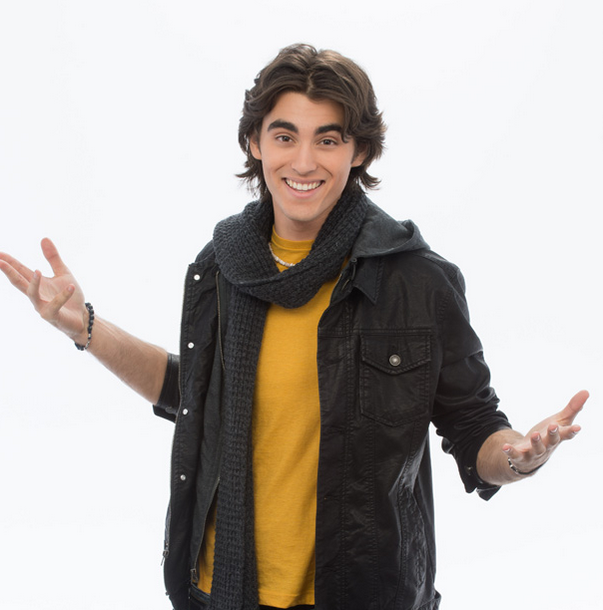 So it was no wonder that several of my readers mentioned that a recent episode of “Dog With A Blog” featured the teen named Tyler playing the musical spoons, a topic that we’ve shared several times on Tiny Tapping Toes. And he did a terrific job! But, if you look closer, he was using two connected spoons, like the ones you see below. And that sure does make playing the spoons a lot easier. In fact, there’s a big behind-the-scenes look at Dog With A Blog tonight (Thursday, September 24, 2015) and we really hope they share some of their musical spoon outtakes! Are you intrigued by the spoons? Here’s a quick run-down of tips for playing any kind of spoons you might find! Ok, this one is simple. 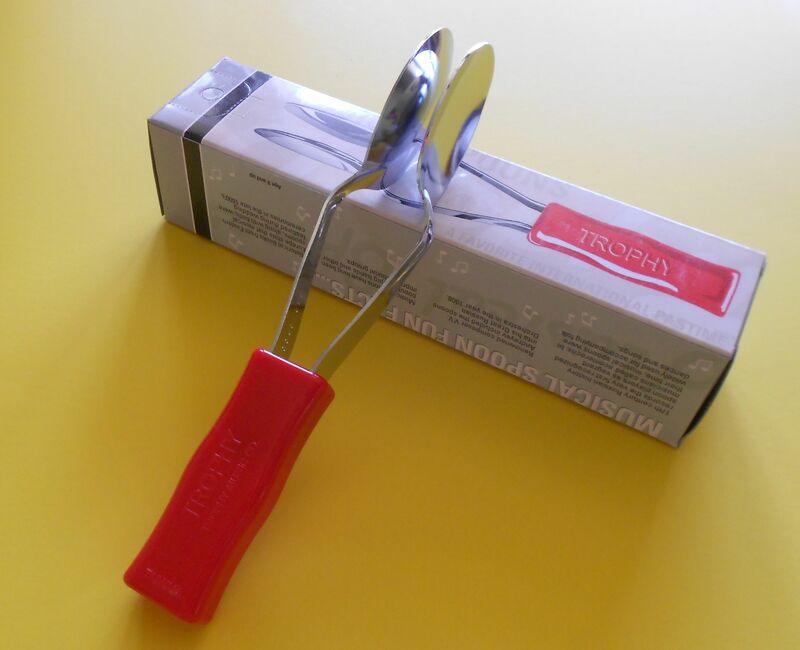 You hold the spoon in one hand and tap either side on your knee and your opposite hand. Go back and forth until you create a beat! To get tricky, go back and forth between your hand and any other object, like your shoulder, someone else’s shoulder, the chair you’re sitting on, you get the picture, right? In short, you’re making a beat by tapping the connected spoons against your hand on one other surface. With a bit of practice, you can make this sound amazing! This is the original way of playing the spoons and does take a bit of coordination. Check out our step-by-step post here and you’ll also find how to make that cool “trill” or “b-r-r-r-r-r!” noise with your spoons”. Okay, the last two were rather tricky and required lots of motor skills to accomplish. You can also feel free to play the spoons with young children by using them like rhythm sticks. Tap them gently together to make a beat. Sit opposite your child and tap the spoons together, making a beat while singing a song or playing music. Have your child match your movements to make the beat, too! It’s a simple rhythm and music game with items that everyone has around their house. 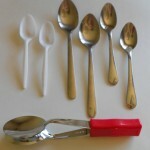 And; yes, you can use plastic spoons as well! 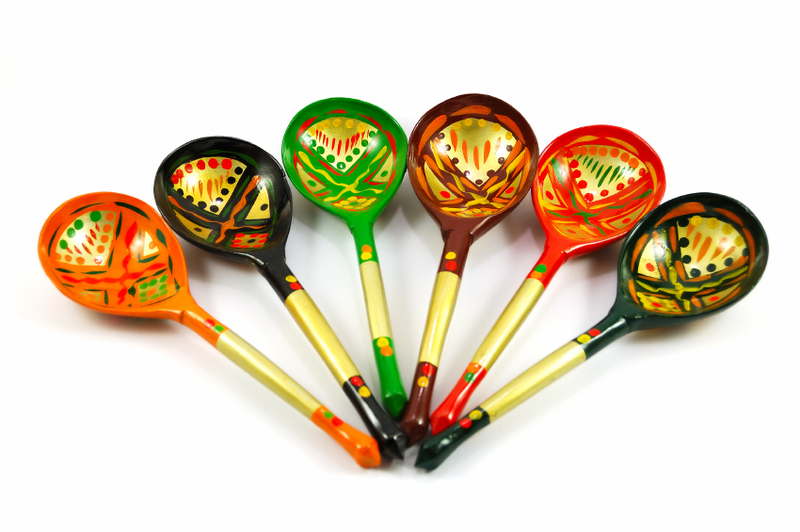 It’s probably not surprising that other cultures discovered these everyday items could be used for as musical fun.Russian musical spoons, known as lozhki (Ло́жки), are the beautifully carved and decorated wooden spoons famous in that region of the world. If you’d like to check out that form of musical spoons including some truly sensational hand (and foot) work, check out this post and video from Making Multicultural Music, below. Want to see musical spoons in action? Here’s one American spoon video and one that features a Russian spoon expert. It’s So Simple To Play The Spoons! Would you like to dazzle your young children or quiet a classroom of kids? Or be the star of the next long car or bus ride? Then take a few minutes to master the art of the musical spoons and you’ll soon be playing like a professional percussionist! All you need for developing this homegrown skill are two spoons and a bit of patience and practice. First, find two spoons of equal size and shape. Although seasoned players can make any two spoons work, it’s best to learn with matching spoons. 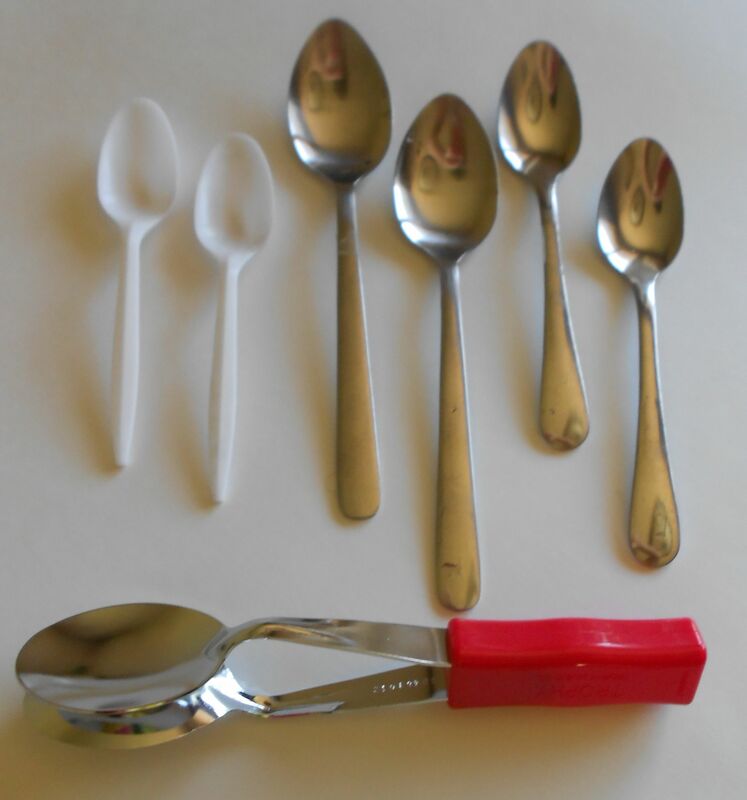 Any spoons will work; even plastic ones, however the best sounds seems to come from the heavier metal ones so find a few pairs and see what sounds best to you. The real trick to playing the spoons is getting the right grip. Take a look at this picture. Put the end of one spoon between your thumb and pointer finger. Put the end of the other spoon between your pointer and middle finger. Hold them all the way down near the end of the spoons grasping tightly enough not to drop them but loose enough so that they can still click together. If you’re right handed – you’ll probably do better with your right hand and vice versa for lefties! Take your spoons and see if you can make them click together. 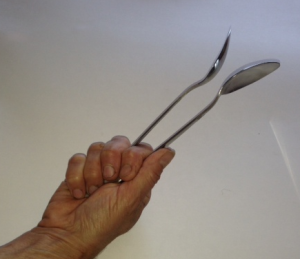 Tap them between your knee and your other hand (held above the spoons), moving the spoons – not your knee or your “non-spoon hand”. Tap back and forth until you get a nice steady rhythm. Try it slow. Try it fast. Try it along with your favorite song. Then you’ll be ready to move on to the fancy stuff! Once playing a simple beat isn’t enough, try this move that sounds a bit like a drum roll! 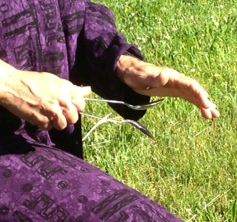 Hold your spoons in your dominant hand and place your other hand, palm up with fingers spread. Hold the fingers of your “non-spoon hand” as stiffly as you can. Then, brush the spoons over your upturned hand allowing them to clink once on each finger, like a ball falling down stairs and tapping each one along it’s way. Practice this until you can do this smoothly and can add it to any song effortlessly while playing. The best way to get good at playing the spoons is by practicing. Play along while you sing. Play along while your child sings. Play along to your favorite recorded music or a family member who can play an instrument. Although this is a simple instrument, it can really add a lot to a front porch jam or an impromptu music party! And if all else fails, you can get a pair of connected spoons, just like these! Happy tapping!